Egypt’s Minister of Defence Sedky Sobhy on Sunday announced a reshuffle of several senior military positions, Al-Ahram Arabic news website reported. Major General Salah El-Badry, the head of military intelligence, was replaced by Major General Mohamed El-Shahat, the head of the second army. 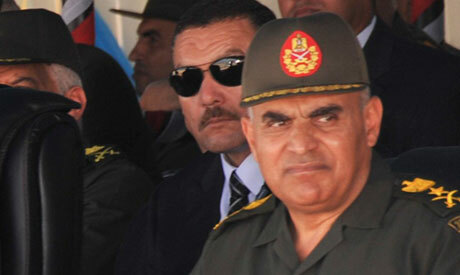 Major General Nasser El-Assy replaced Major General El-Shahat as the head of the second army. Major General El-Assy was the second army’s chief of staff. The second army is the regional division stationed along the Suez Canal and in North Sinai. The division has been engaged in a war against militants in Sinai which has intensified since the ouster of Islamist president Mohamed Morsi in July 2013. Rear Admiral Osama Mounir replaced Rear Admiral Osama El-Gendy as the commander of the navy. Mounir was the navy chief of staff. Rear Admiral Ahmed Khaled replaced Mounir as the navy chief of staff. Egypt’s naval forces are participating in the current Saudi-led joint regional military operation to halt the advance of Iranian-backed Houthi fighters in Yemen. Sissi wants this terror to continue unabated in order to justify the continuity of his despotic junta. We all know that the problem is political, first and foremost. We all know that people resort to violence if they are denied human rights, civil liberties and political participation. In Sissi's Egypt, everyone can participate in politics except the followers of Islam....this is despite the fact that 95-96% of Egyptians are Muslim. Hence, the violence, hence the choas, hence the daily killing. Ahmed, Saudi or Iran ? You sound like a smart guy , though unable to comprehend that TURE followers of Islam in Egypt have no interest in joining Extremist Fake backward POLITICAL groups. The majority of Egyptian Muslims needs Education, jobs, laws, and stability; no “Islamist” political party can offer that. Look around you to Saudi and Iran; is this what you want? We need to take care of our troops in the field to have the best training, physical and determination. Armed forces personnel must be given privileges in society and work places when retired. Tahya Misr.